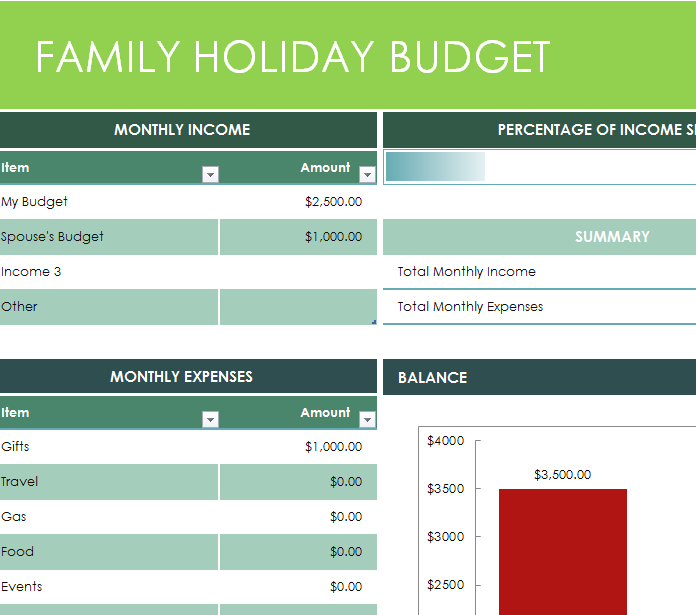 The Holiday Family Budget can help you balance your budget for the upcoming holiday busy season! The Holidays tend to hit your wallet pretty hard. The best strategy to cope with this knowledge is to be prepared. That’s where the Holiday Family Budget comes into play! Simply download this template for free and you will have everything you need to take charge of your expenses for the holidays. It’s natural that you want to buy your loved ones nice things during this time of the year, but that doesn’t mean you have to go bankrupt for being thoughtful. As a holiday gift to you, you can download this budget template for free! So what are you waiting for? The holiday season is closer than you think. You can download this Family Budget by clicking on the link provided at the bottom of this page. Doing this will automatically download the document to your computer! The budget is broken into 4 different sections for your convenience. Start in the “Monthly Income” table; this is where you will enter your budget amount. The table also gives you a place to enter any additional forms of income that could attribute to your budget. The only other section of the 4, that you need to fill out, is the “Monthly Expenses” column. In this section, you can enter a list of all your holiday related expenses for the month. To change any of the pre-written categories, simply click inside the cell you wish to change and start typing your new information. The last two sections, “Percentage of Income Spent” and “Balance” simply provide you with an overview of all your financial information. In these tables, you will see your total budget amount and the total amount spent, as well as your remaining balance. Finally, the template gives you a graph, so you’ll have a clear visual of your finances by the end of your holiday shopping. Make the holidays work for you and your wallet with this convenient budget sheet! Use this template to make your own holiday budget this year!